Lungs are the organs of respiration and are enclosed by the right and left pleural cavities, located on both side of the Mediastinum. 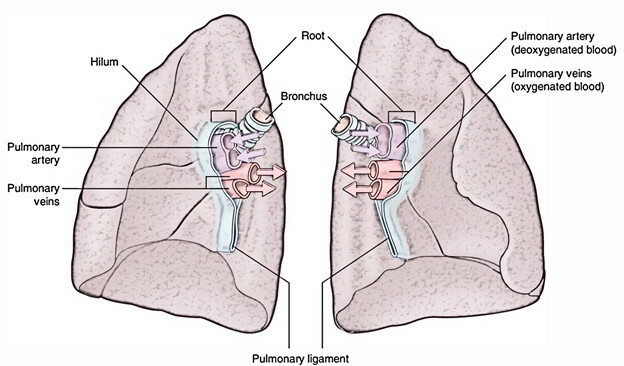 Main bronchi, which are branches of the trachea, help air as it enters and exits via the lungs. Since the middle mediastinum, which contains the heart, protrudes more to the left as compared to the right, the right lung is normally a little larger in contrast to the left lung. The main function of lungs is to exchange of 02 and C02 between inhaled air and blood this process is called Oxygenation. The right lung weighs approximately 700 g and left lung weighs around 650 g. The left lung has two lobes and the right lung has three lobes. The lobes are separated by deep prominent fissures on the surface of the lung and are supplied by two lobar bronchi. The microscopic structure of the lung consists of air passages dividing then subdividing within smaller then further smaller branches that are escorted by smaller and smaller branches of the pulmonary artery. When the bronchi become smaller they are known as bronchioles. Finally numerous respiratory bronchioles are made by further splitting of bronchioles. Alveoli are made by successive division of alveolar saccules, which are formed by division of alveolar ducts that are made by further division of a respiratory bronchiole. Surrounding the alveoli, the pulmonary arteries terminate as a Capillary Network. The pulmonary veins are formed by vessels which arise from this Capillary Plexus. These veins are free from the bronchi and pulmonary arteries and run towards the hilum. The Base is placed on the diaphragm. The Apex protrudes over rib I as well as within the root of the neck. The Two Surfaces: the costal surface lies directly nearby to the ribs as well as intercostal spaces of the thoracic wall and media. The inferior border of the lung is pointed and also splits the base from the costal surface. The Anterior and Posterior Borders divide the costal surface by the medial surface. The Posterior Border is smooth and rounded in contrast to the anterior and inferior borders, which are sharp. The space in the middle of the thorax between the two lungs as well as pleurae is called Mediastinum. It spans from the sternum in front towards the vertebral column backwards, and by the thoracic inlet over towards the diaphragm below. It has two sections which are Superior and Inferior mediastinum which is above and below the manubriosternal joint. The vagus and phrenic nerves. The beginning or end portion of the large vessels. The oesophagus behind the heart. The Oblique Fissure splits the inferior lobe via the superior lobe and the middle lobe of the right lung. The Horizontal Fissure divides the superior lobe from the middle lobe. 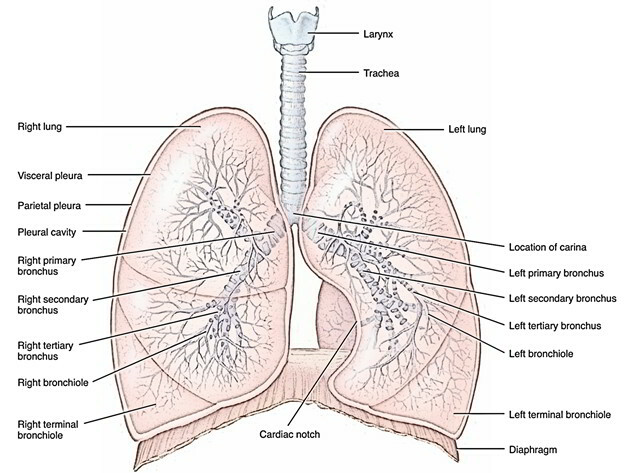 The left lung has two lobes divided by an Oblique Fissure and it is smaller than the right lung. Compared to the resembling fissure of the right lung, the oblique fissure of the left lung is a little more oblique in shape. 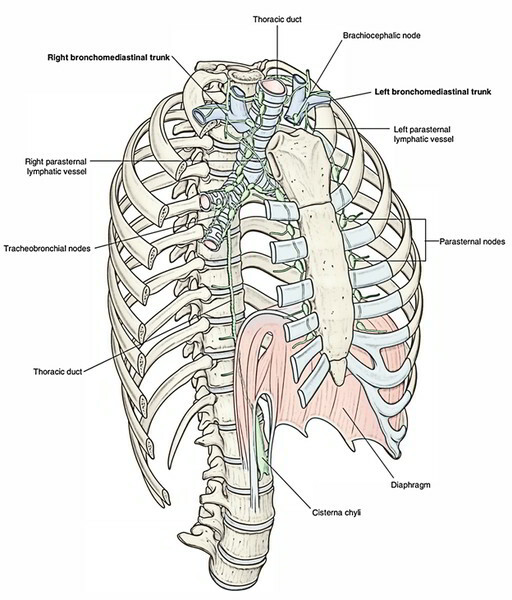 Throughout soundless respiration, a curved line on the thoracic wall that begins among the spinous protuberance of vertebrae t3 and T4, intersects the fifth interspace laterally and trails the outline of rib VI anteriorly, marks the estimated position of the left oblique fissure. 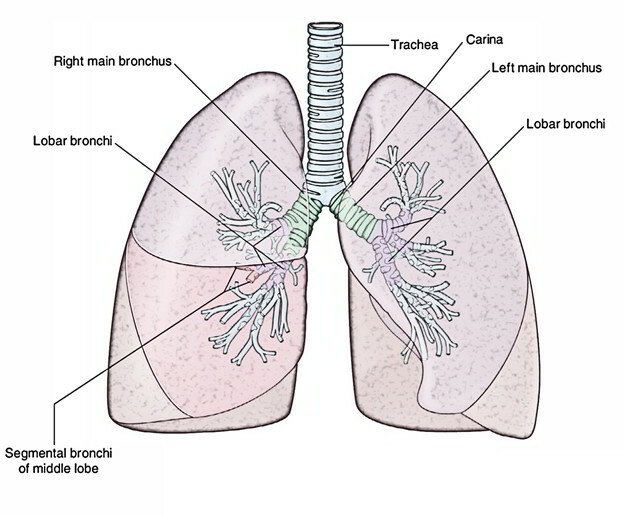 Every lung contains a Bronchial Tree, which is named due to its resemblance of a tree in shape; it is the complex network of air channels that supply the lungs with air. Alveoli are the air-filled sacs in the lungs that resemble bunch of grapes. Macrophages are White blood cells that are located inside each alveolus that consume and destroy airborne irritants and antigens that enter the lungs. The lungs remain partly expanded after exhalation due to a fluid called Surfactant is secreted inside the alveoli and is formed by special cells. Surfactant contains Lipoproteins and assists to preventing lung infections. Together, the lungs’ tissue surface is nearly 40 times greater compared to the body’s outer surface that makes the lungs one of the largest organs in the body. 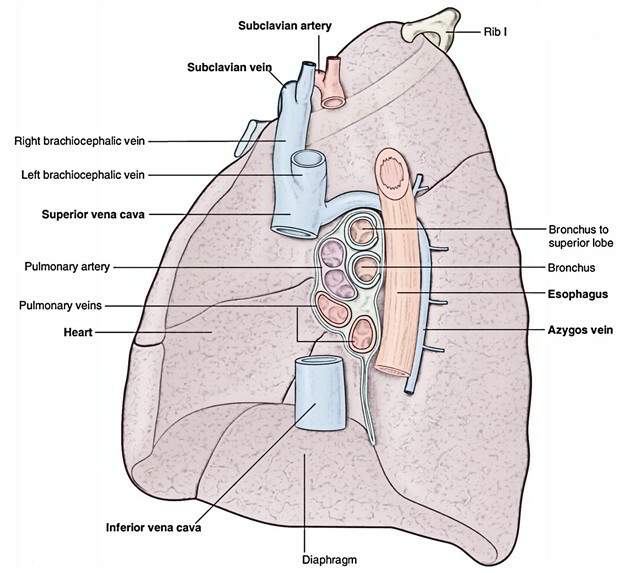 Due to a bronchial and a pulmonary circulation, the lungs have a double blood supply. The bronchial arteries that leave the aorta supplies oxygenated blood to the airways of the lungs to the bronchial circulation. There are usually three arteries which divide together with the bronchi and bronchioles, two to the left lung and one to the right. The pulmonary circulation transports deoxygenated blood via the heart to the lungs and returns the oxygenated blood to the heart to supply the rest of the body. 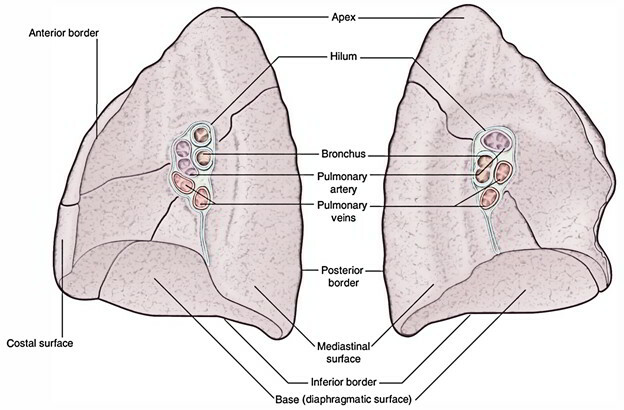 The lungs and the visceral pleura is supplied by visceral afferents and efferents distributed over the anterior pulmonary plexus and posterior pulmonary plexus. 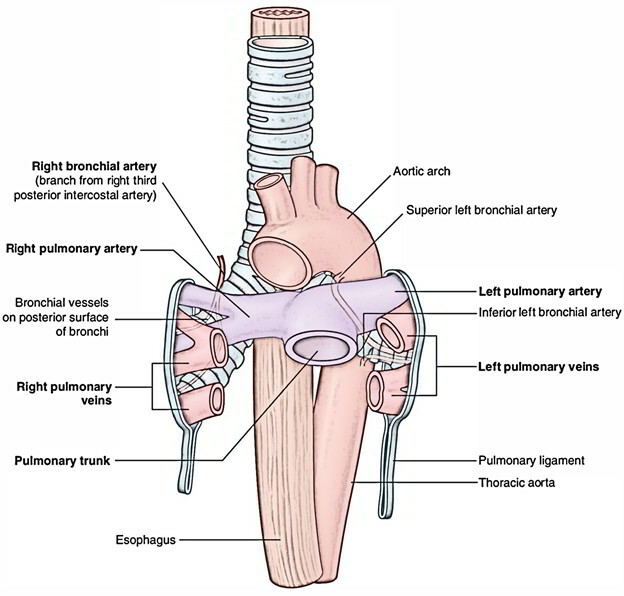 These interconnected plexuses are located anteriorly and posteriorly to the tracheal bifurcation and main bronchi. The posterior plexus is much greater than the anterior plexus. 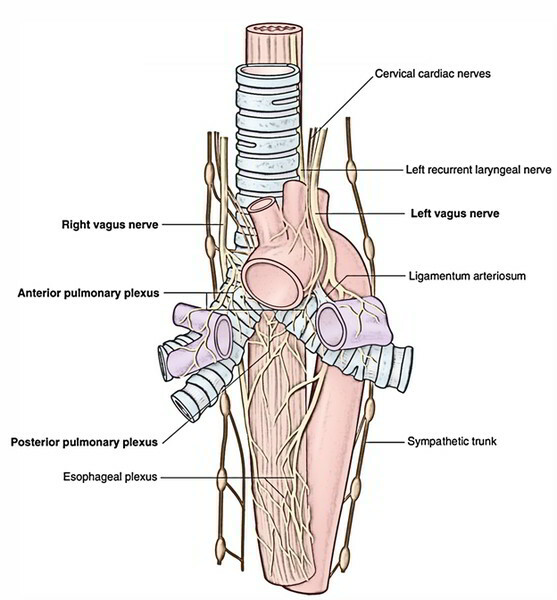 Branches of these plexuses are distributed alongside sections of the airway and vessels, which eventually start from the sympathetic trunks as well as Vagus nerves. 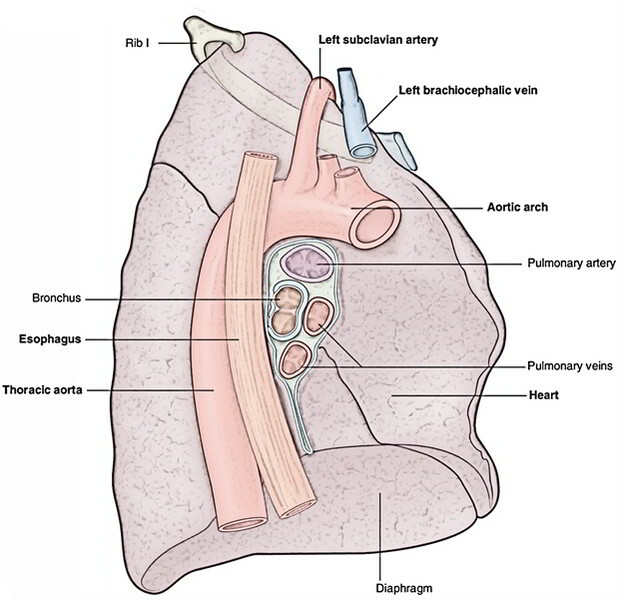 Superficial, or subpleural, along with the deep lymphatics of the lung surrounding the roots of lobar and main bronchi and alongside the sides of the trachea drain into lymph nodes known as Tracheobronchial Nodes. These lymph nodes extend front within the lung, via the hilum and root, and inside the posterior mediastinum as a group. Bronchitis is swelling of the bronchi. A swelling of the mucous membrane is caused by the inflamed tissue. This increases mucous production with a decrease in the ability to move the mucus up to the throat by the Cilia. This results in impairing breathing by a decrease in the width of the Bronchial Tubes. An infection with bacteria or viruses can cause Bronchitis. Irritants like air pollutants or cigarette smoke can also develop it by increased exposure. The destruction of the walls of the alveoli causes Emphysema. It is incurable and it is a progressive degenerative disease. Prolonged exposure to respiratory irritants like tobacco smoke and air pollutants is main cause of emphysema. The surface area of the respiratory membrane is decreases as alveolar walls start to deteriorate. The amount of gas that can be exchanged in respiration is decreased. The alveolar walls also lose the ability of the lungs to recoil and expel air decrease in elasticity. Enlargement of the thoracic cavity and shortness of breath are common symptoms. By removing the source of irritants, such as stopping smoking, or the use of bronchodilators to assist in breathing the progress of the disease can be slowed down. Primary pulmonary cancers are cancers that begin in the lungs. Via uncontrolled growth of epithelial cells the most common form emerges and is called bronchogenic carcinoma. Due to prolonged exposure to irritants like tobacco, smoke, C02, dust, asbestos, radiation, and vinyl chloride this form develops. Cancer in the lung can quickly extend to other parts of the body because of the rich blood supply in the lungs. Lung cancer is difficult to restrain but is treated with surgery, radiation, and chemotherapy. Persistent cough, difficulty breathing, excessive sputum, or blood containing sputum is general symptoms.